Sputtering is a physical deposition technique that relies on the removal of a material from a target by energetic ion bombardment in order to coat a substrate with the target material. The technique can be combined with reactive gases to form oxides and nitride films. 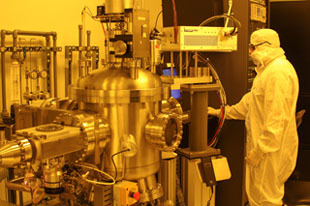 The Penn State Nanofab currently maintains 5 sputtering systems. ITO 3000 A Sputter thin filmsIndium tin oxide is a widely used transparent conducting oxide. Its electrical conductivity and optical transparency make this a desirable material for several applications. In thin film form ITO has been used in liquid crystal displays, flat panel displays, plasma displays, touch panels, organic light-emitting diodes, solar cells, antistatic coatings and EMI shielding. 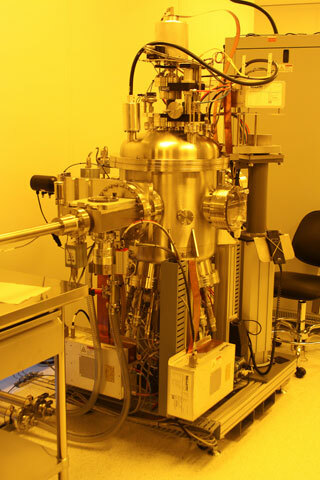 ITO sputter thin films have been deposited in the Kurt J. Lesker CMS-18 sputtering system. The film displayed in the image was deposited onto a standard microscope slide at 300 C to a thickness of 3000 angstroms. The sheet resistance was measured with a four point probe and found to be 10 ohm-square. Sputtering of piezoelectric/pyroelectric/ferroelectric devices stacks that include PZT (lead zirconate titanate), PLZT (lead lanthanum zirconate titanate), and platinum (Pt) is done in Kurt Lesker Sputter #3. An additional system from 4Wave is a unique blend of ion beam deposition and sputtering. Up to three source materials can be deposited simultaneously or in succession to deposit mixtures or multi-layered materials. The system offers the ability to precisely control the oxygen (or other reactive gas) content of the deposited film with the use of a fully integrated residual gas analyzer. (RGA) This has enabled better control of vanadium oxide deposition. Other materials will be added in the future. 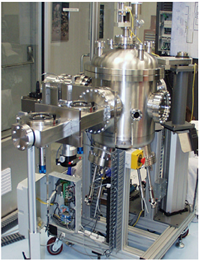 The 4-Wave ion beam deposition system employs a low energy ion source to generate Ar ions. By applying a bias to the target or targets, the ions are accelerated to initiate the sputtering process. The flux of ions generated by the source aids in directing the sputtered material. The sputtered material is subsequently deposited down stream from the ion source. Please contact William Drawl for training. The CMS-18 is an extremely flexible three target reactive sputtering system with a load lock capable of small parts through 6" wafers. 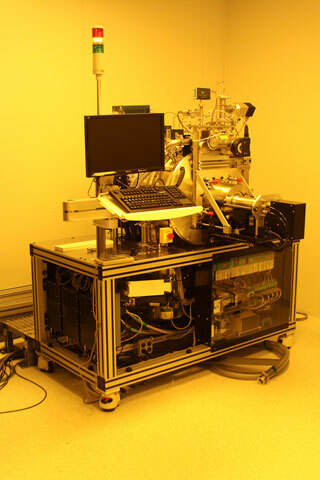 The system is capable of depositing multilayer film stacks, alloys, and reactively sputtered oxides and nitrides. The system is also setup for substrate heating as well as RF biasing and sample pre-cleaning. Substrate bias 100 Watts RF for pre-cleaning and ionization of reactive gases oxygen & nitrogen. The CMS-18 is an extremely flexible four target reactive sputtering system with a load lock capable of small parts through 6" wafers. The system is capable of depositing multilayer film stacks, alloys, and complex oxides such as PZT (lead zirconate titanate). The system is also setup for substrate heating as well as RF biasing and sample pre-cleaning. The CMS-18 is a flexible two target sputtering system with a load lock capable of small parts through 6” wafers. The system is capable of depositing multilayer film stacks and alloys. The system is also setup for substrate heating as well as RF biasing and sample pre-cleaning. Substrate bias 100 Watts RF for pre-cleaning.